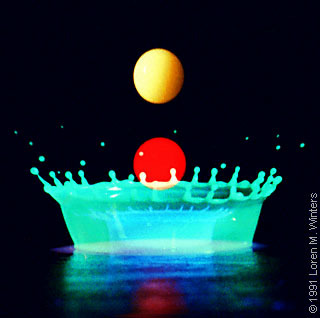 A sequence of four flashes illuminated a single milk drop falling onto a table for this photograph. Each flash of light, coming from a different flash unit, passed through a colored filter. This gave each of the four images a distinct color. The order of flashes was yellow, red, blue, green. While this technique gives a colorful photograph, the main purpose is to provide visual separation between overlapping images. For example, the image of the milk crown created by the blue flash shows distinctly through the green image. Imagine how difficult it would be to see two overlapping white images. A secondary effect of this technique is to produce different colors where two other colors overlap. For example, yellow is seen where green and red overlap. Also, the "blue" image is actually cyan (sky blue or aqua) in color. This is the color that results from the combination of green and blue. The four flash units for this photo were controlled by a computer. When the drop passed through a light-sensitive gate, not shown, the computer started a timing sequence. At the end of a predetermined time interval, the computer discharged the yellow flash unit. The computer then discharged the remaining flash units six thousandths of a second apart. This computer intervalometer system is described here. If you see a predominance of these colors on the HiViz.com website, now you know why.